New Delhi: India’s efforts to make Japan agree to swap gas that it sources from West Asia with supplies obtained by India off the Russian coastline is unlikely to succeed. Tokyo is averse to any deal involving its neighbour Russia, which it fears may turn off supplies for political reasons. If the deal had come through, it would have substantially cut the transportation costs and then the landed price of gas to both India and Japan. Japan Oil Gas and Metals National Corp., or Jogmec, had earlier agreed to explore possibilities with ONGC Videsh Ltd, or OVL, the overseas arm of India’s Oil and Natural Gas Corp. Ltd, for swapping or selling gas from the latter’s blocks in Russia’s Sakhalin-1 as reported by Mint on 10 February 2008. Russia, which has around a quarter of the world’s gas reserves, is a major gas supplier to European countries and it has used its position as a political tool—by threatening to turn off supplies. It has also muscled out majority stakeholders in its hydrocarbon assets. In 2007, Russia had acquired stakes from Royal Dutch Shell Plc. 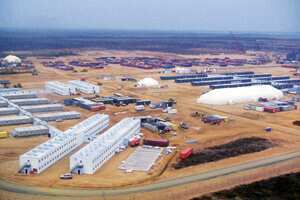 (Shell), Mitsui & Co. Ltd and Mitsubishi Corp. in its Sakhalin-2 project by making them dilute their stakes by 50% each. This resulted in them having a share of 27.5%, 12.5% and 10%, respectively, thereby making state-owned OAO Gazprom the majority stockholder in the project. “We are still very unhappy about the way the Russians forced their terms. I even doubt whether the Japanese firms received any compensation for diluting their stake," the official added. A senior ONGC official, who didn’t want to be identified, said he was unaware of Japan’s reluctance for a gas-swap deal. It is estimated that India needs around 180 million standard cu. m per day (mscmd) of gas, particularly for sectors such as power generation and fertilizer, but current supplies are around 81mscmd. Indian companies have been unsuccessful in securing LNG supplies in the international market due to a rise in international demand, particularly from Japan, on account of the lower nuclear power generation there, that resulted in spot prices ranging between $17 and $21 per million British thermal unit (mBtu). Half of LNG imported to Japan is sourced by Mitsubishi. “Gas swaps are not something which is happening on a large scale worldwide. It is possible in oil as half of the oil produced in the world is traded either in the form of crude or petroleum products. One cannot also argue with Japan’s question of who will guarantee supplies from Russia," said Ajit Kapadia, vice-chairman of the Centre for Fuel Studies and Research, a Vadodara-based think tank. Exxon Neftegas Ltd is the operator for the multinational Sakhalin-1 consortium with ExxonMobil Corp. having a 30% stake in the consortium. The other partners include Sodeco of Japan with 30% stake, RN-Astra of Russia with an 8.5% stake, Sakhalinmorneftegas-Shelf of Russia with 11.5% stake and OVL with a 20% holding. In return for its $1.7 billion investment in the Sakhalin-1 project, OVL is expecting 2-4 million tonnes of crude oil annually and 5-8 million cu. m of gas per day.